DOW Chemical has been in business for over 100 years resulting in professional grade products for residential and commercial use that are tried, true, and tested. All of these products are evaluated by the ICC - Evaluation Service which is an Independent National Testing Agency. Additionally, these products are manufactured direct by DOW, removing third party suppliers from the equation. Patented DOW Dispensing Gun ensures proper yields and extends usability of tanks! Fastest way to ensure maximum insulating values from all your building materials. 24/7 Technical Support Hotline for all your questions and concerns: 866-583-2583. Try our New Board Ft Calculator for your spray foam project! Dow Froth Pak 210 or 650? Let us help you decide which is the best kit for your project. 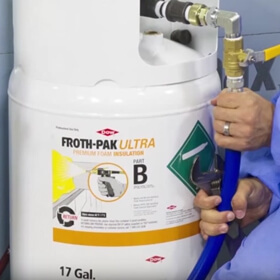 Learn More about the multiple sizes and features of all of our DOW Froth Pak kits. And, if you are still unsure, just give us a call! Straws vs Pro Cans - What's the Difference? Want Better Value? Turn Pro!